Note. 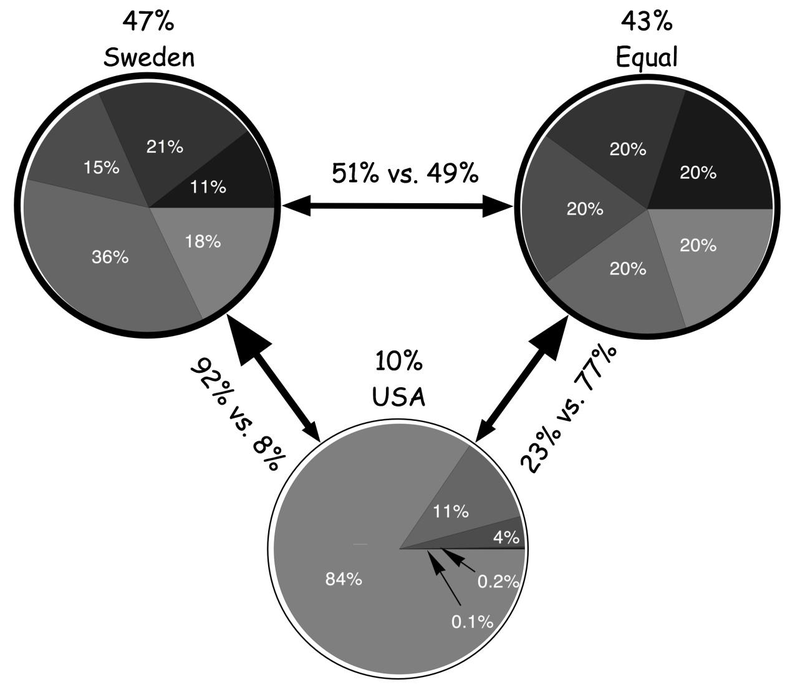 Pie charts depict the percentage of wealth possessed by each quintile; for instance, in the United States, the top wealth quintile owns 84% of the total wealth, the second highest 11%, and so on. The myth of “trickle-down wealth” is still largely held in the U.S., especially by the right-wing, even though Reagan’s own budget director, who promoted this economic policy in the ‘80s, advocates against it today. A new study on American’s beliefs about the U.S. economy shows that American’s perceptions do not match reality. Respondents dramatically underestimated the current level of wealth inequality. Respondents constructed ideal wealth distributions that were far more equitable than even their erroneously low estimates of the actual distribution, believing that the wealthiest quintile held about 59% of the wealth when the actual number is closer to 84%. All demographic groups – even those not usually associated with wealth redistribution such as Republicans and the wealthy – desired a more equal distribution of wealth than the status quo. Respondents were presented with the three pair-wise combinations of these pie charts (in random order) and asked them to choose which nation they would rather join. A large nationally representative sample of Americans seems to prefer to live in a country more like Sweden than like the United States. Finally, and more broadly, Americans exhibit a general disconnect between their attitudes towards economic inequality and their self-interest and public policy preferences, suggesting that even given increased awareness of the gap between ideal and actual wealth distributions, Americans may remain unlikely to advocate for policies that would narrow this gap. Hopefully, the same wll not be true of the church.